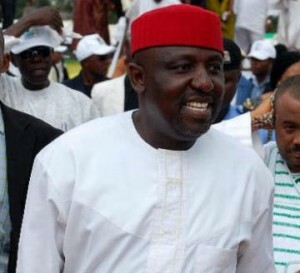 Imo Governor, Rochas Okorocha, has said Igbo may lose, again, as they did in the civil war, over lack of political intelligence to detect current political battle that is on going in the general election. He alleged that the current conspiracy to stop him from going to the Senate is because he is resisting the political captivity of Imo State. Okorocha, who said this, yesterday, during an interactive session with newsmen in the state, regretted that Igbo are yet to understand the new political battle going on in the country, which he likened to the civil war, which Igbo fought without a weapon. “Ndigbo, especially the apex leadership of Ohanaeze, is yet to understand the new political battle that is going on now, which is like what had happened during the civil war, where the people fought without a weapon. The same war is coming now, which is a political intelligence war. In this war, the Hausa and the Yoruba have done well, but, Ndigbo don’t understand and they may pay dearly for it. He maintained that Igbo did not lose the civil war because of lack of resources, but because Ojukwu was betrayed. “What I‘m resisting is the systematic political colonisation of Imo State, because, if Senator Hope Uzodinma becomes the governor, the state would be ruled from Abuja and Port Harcourt. The issue is not about if Uche Nwosu becomes the governor of the state, but the conspiracy is to bring me down; that is why I said Ojukwu was betrayed by the likes of Ifeajuna. “Now, what is the interest of Oshiomhole and Amaechi in who becomes the governor of the state?It’s just to stop me, in order to hold the state politically captive, and I’m going to stop it. If I go to the Senate and Nwosu becomes the governor, they know I’ll be politically stronger for the presidential race in 2023. But, I’ll fight the conspirators to a stand still,” he said. Okorocha also claimed that it is difficult to convince the electorate to vote for the governorship candidate of the All Progressives Congress (APC) in the state, Uzodinma. The governor, who said this while chatting with newsmen, yesterday, at the Government House, Owerri, noted that he tried campaigning for Uzodinma during his flag off campaign at Orlu, on Monday, but, disappointedly, was rejected by the crowd. He further claimed that the crowd, rather than routing for Uzodinma, went wild with Nwosu’s name when he asked them to vote for Uzodinma. Meanwhile, Nwosu, yesterday, kicked off his rural campaign for President Muhammadu Buhari, as he campaigned in Onuimo and Okigwe with other candidates of his Action Alliance (AA). He urged the mammoth crowd to vote for Buhari to ensure an Igbo presidency for 2023. He however, promised that his administration, if voted in, will cater for majority of youths in the state.